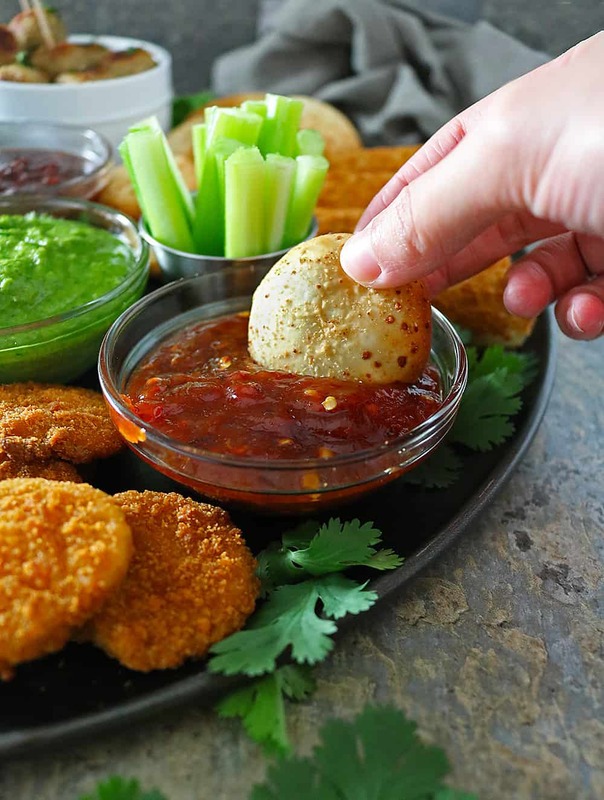 I’ve partnered with Farm Rich to bring y’all this Spicy Saucy Snackin’ Platter featuring Spicy Chili Maple Sauce, Spicy Peach Sauce, Spicy Green Sauce, and, Spicy Date Sauce for your homegating party or casual get-togethers! To be perfectly honest, when it comes to sports, I have no idea what season it is. I don’t have a clue when football ends and basketball begins. Gosh, most times when I get invited to a homegating party and am asked to bring a dish or three, I don’t have a clue as to who or what game is playing. Most times, not even after I get there! To me, gameday get-togethers are all about the food! And, most of them seem to have a platter or two of Farm Rich snacks and appetizers! 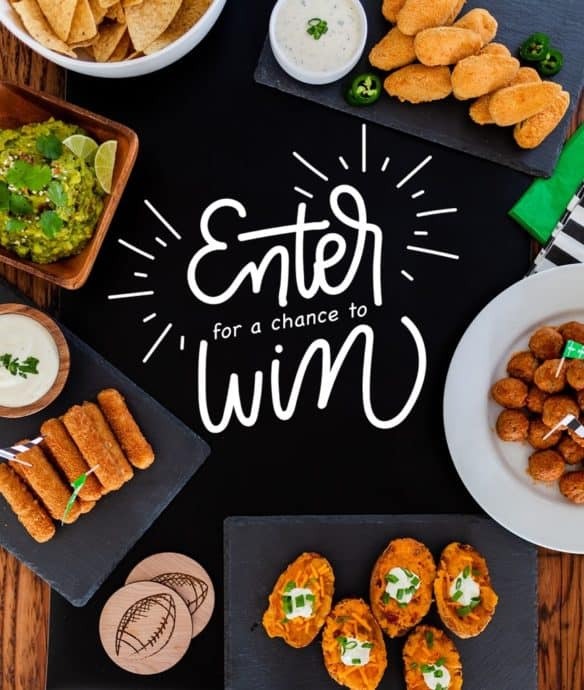 Speaking of Farm Rich, make sure you head on over to their Instagram page @FarmRichSnacks to enter for the chance to win one of several prizes in the Farm Rich Giveaway, including a game-day party in a box and TV (scroll down for all the deets). As mentioned in this Potato Skin Pile Up, we are huge fans of Farm Rich products in our house. Farm Rich has a wide variety of products ranging from Mozzarella Sticks and Meatballs to Loaded Potato Skins and Grilled Cheese Sticks. They make snacking fun and oh-so-easy. 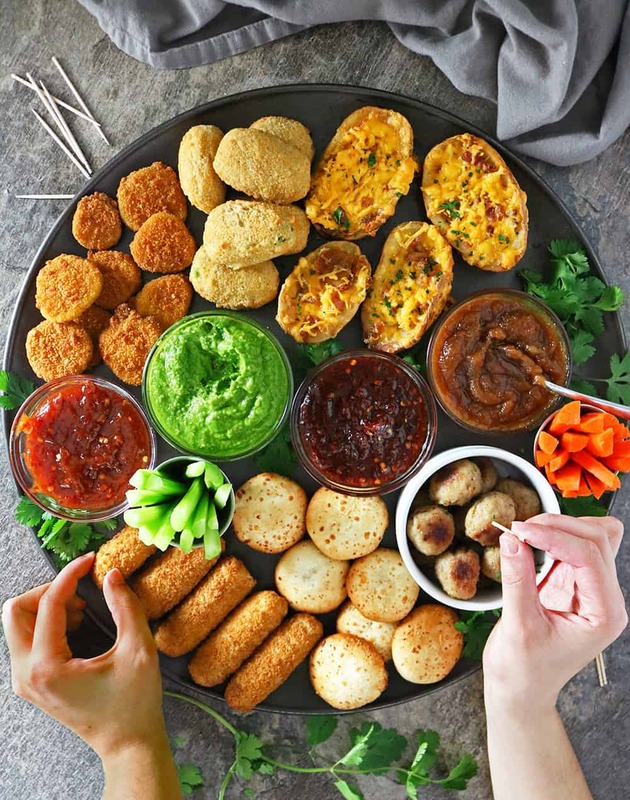 Farm Rich products can be enjoyed as quick snacks and are great for hosting on game day or having during casual get-togethers. Each of these sauces is so easy to pull together and only use 5-6 ingredients. These sauces pair beautifully with every one of the Farm Rich snacks and appetizers we had on our platter. 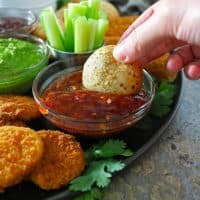 With another game day invite on the horizon for Feb. 3, I plan on whipping up these easy spicy sauces and throwing together a platter with Farm Rich Mozzarella Sticks, Farm Rich Meatballs, Farm Rich Crispy Dill Pickles, Farm Rich Loaded Potato Skins, Farm Rich Jalapeño Peppers, and Farm Rich Mozzarella Bites. 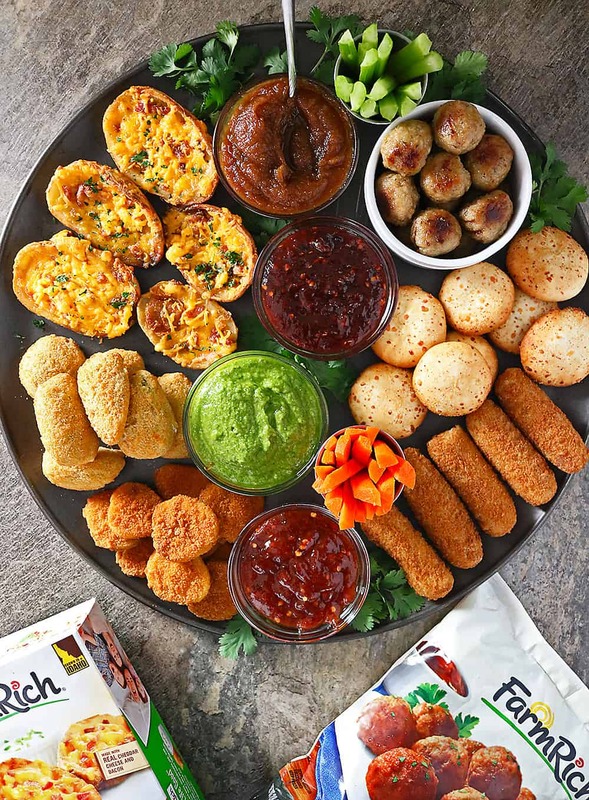 Farm Rich is one of America’s favorite snack and appetizer brands, offering great tasting food for your game day “homegate”. Whether you are entertaining for just your family or what feels like a packed stadium, Farm Rich has you covered! 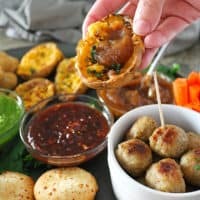 My sister is all about microwaving all the snacks, so it’s pretty darn fantastic that many of the items like Farm Rich Mozzarella Bites, NEW Grilled Cheese Sticks, Pulled Pork Sliders, Meatballs and Loaded Potato Skins can be microwaved and ready in just minutes! You can find more game day ideas right here. Plus, find out more about the Farm Rich game day giveaway on Instagram, and get the Official Rules HERE. Tantalizingly spicy and sweet, this Spicy Chili Maple Sauce is sure to be a hit at your Game day (or any day) get-togethers! Add maple syrup to a small saucepan over low heat and let it warm up a bit. Grate in the garlic clove. Add in the tomato paste, red wine vinegar, and chili flakes and mix well. Let simmer for about 2-3 minutes then season with salt and pepper to taste and enjoy. Full of peachy goodness, this Spicy Peach Sauce is so finger-licking tasty! And, it pairs so well with all your Game day snacks! Add peach jam to a small saucepan over low heat and let jam melt a bit. Then add in orange juice, chili flakes, tomato paste and stir well. Finally season with salt and pepper to taste and enjoy. 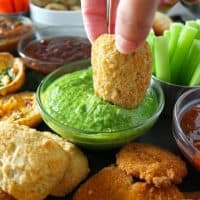 With simple ingredients like spinach, chickpeas and jalapeno, this Spicy Green Sauce pairs well with snacks, pasta and even chicken! Add chickpeas, fresh spinach, cilantro, water, olive oil and jalapeño to a food processor or blender and process until all ingredients are well blended. Then, season with salt and pepper to taste and enjoy. Tangy, sweet, spicy, creamy and delicious, you are going to want to serve this Spicy Date Sauce at your Game day (or any day) get-togethers! Add garlic, soaked, pitted medjool dates, water, coriander, apple cider vinegar and chili powder to a blender or food processor and process until all ingredients are blended and sauce is smooth. Then, season with salt and pepper to taste and enjoy. This is a sponsored post written by me on behalf of Farm Rich. o my…I would probably snack them all day long! Oh my! That platter is amazing! I love the sauces. I can snack on it all day. 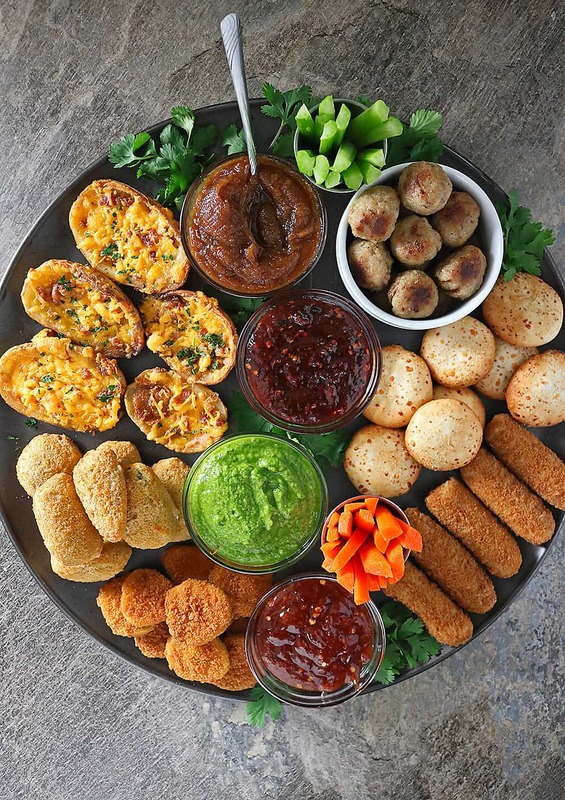 This snacking platter looks and sounds so delicious! Perfect for hosting! 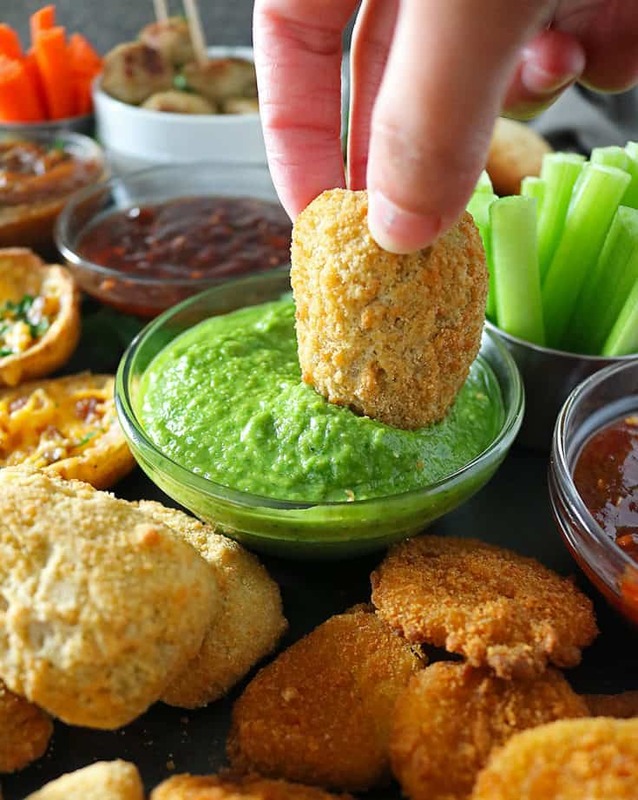 This is perfect for all the game day snacking. 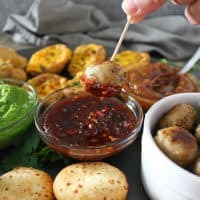 I love the idea of all the sauces to go with the appetizers, they all sound and look delicious. I could certainly dive into that platter, especially with all of those yummy sauces! Farm Rich sound amazing and this whole platter looks incredible! Just up my street! A nice collection of sauces that would fit well with many dishes. I especially like the Spicy Green Sauce. I think it would be great with falafels. Wow! I’m not sure which I like better! The snacks or the sauces! 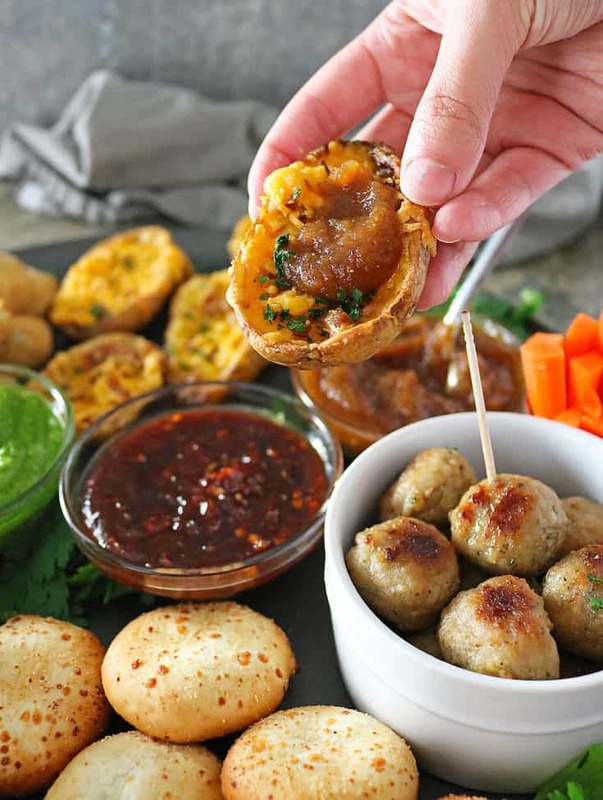 These Farm Rich appetizers are right up my 18 year olds’ alley! Fast and delicious! And these sauces all sound amazing! Great post! Yum! I will find it hard to stop snacking on these. Oh my goodness. I don’t really follow the NFL because I’m a college football fan, but I’ll bring this platter to a Super Bowl party any day! 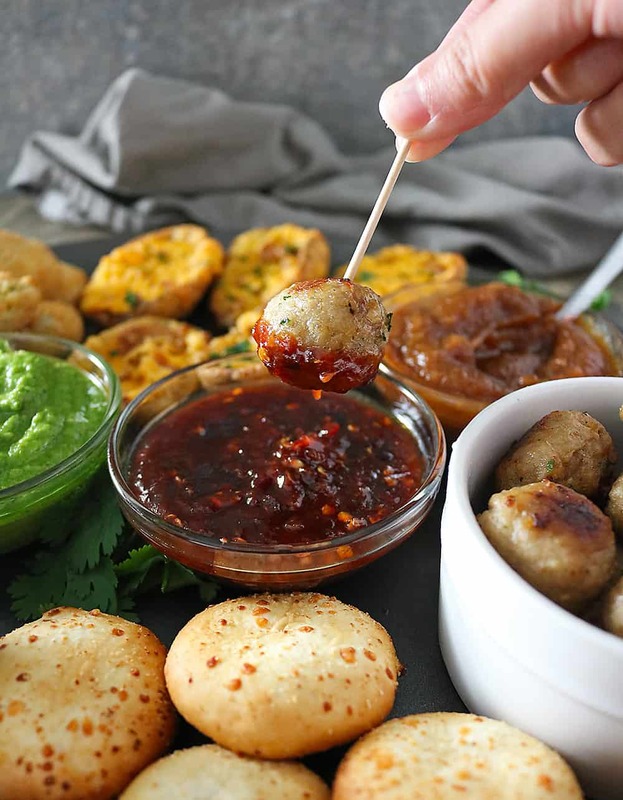 Nothing beats a bunch of yummy snacks like this!